An LED sign provides an essential means of communication between the school and its community, parents, students and teachers. 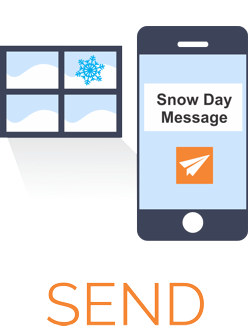 From daily announcements to emergency messages, keep your campus informed and prepared through the power of electronic messaging. Multiple signs can be used throughout your facility to increase effectiveness. SignCommand is the first cloud-based LED sign software built with schools in mind. A simple yet powerful online editor allows you to craft a message from anywhere in the world, and then send that message directly to your sign. Your school can optionally give multiple users access to create, maintain and share sign content, making it easy to collaborate on powerful sign visuals. We provide a wide range of school-related graphics and animations to help get you started. Your own logos, symbols, graphics and animations will combine to form a truly eye-catching experience for everyone passing by. 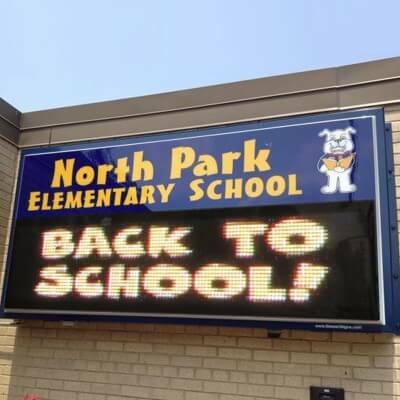 Why choose SignCommand for your LED school sign? Easy messaging capabilities make adding your custom text a breeze. Choose from a wide variety of fonts, colors, styles and outline options, and then size and position the text to your liking. Get your message out! Access powerful editing options right in your browser. Crop and size media to your liking, and even add text on top of images and video clips. Do everything in the web browser; no need for other photo-editing software. Schedule your custom messages down to the minute and years in advance. 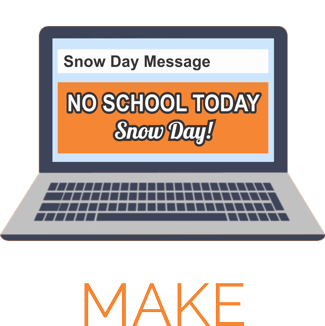 Powerful scheduling options and easy-to-read results means that you will have timely and relevant content always showing on your school sign. Your sign ONLY talks with the SignCommand servers and related services from behind your private network, making it virtually invisible to hackers. And 100% encrypted communication means that no one can eavesdrop on the conversation! Control multiple signs with ease! Send new messages to individual signs or even to a specific side. Whether across the street or across the country, your signs can be any distance apart. Adding a new sign to your network is as easy as turning it on! Windows or Mac, Android or iOS… we support them all! Because all that is needed is a modern web browser, you can run SignCommand from virtually any internet-connected device using any operating system. SignCommand makes it easy to update your school sign from any device. 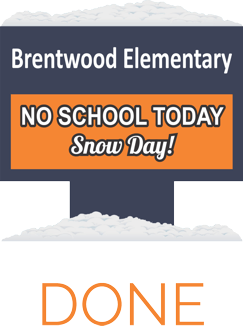 is now on your school sign. Make the most of your investment with our media library. Our built-in and constantly expanding library of video clips and images are optimized for use on signs. With an investment in LED technology, the messages you display will now have the power to be more effective than any other communication method you have. That said, not just any content will have the impact you’re after. We understand this so well, that SignCommand offers an expanding library of graphics included with the purchase of your LED sign. Plus, the power of the cloud allows you to have access to these graphics from anywhere with an internet connection. It will turn a sign that can be read, into a sign that will be read – and it’s all at your fingertips.